Motion Control STAC5 High Performance Stepper Motor Driver from Servo2Go! 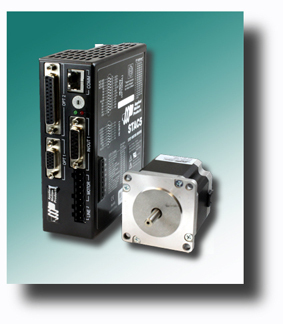 Greenville, DE- Servo2Go.com is pleased to introduce the STAC5 step motor driver from Applied Motion Products. The STAC5 provides up to 5 amps per phase from a high bus voltage with sophisticated current control, delivering high torque over a board range of speeds. An advanced anti-resonance algorithm with electronic damping allows for maximum torque utilization and fast settling times. All STAC5 models include 100Mbit Ethernet communication. The Ethernet interface is used to configure the STAC5 and motor, and also supports the SCL and Q languages over standard Ethernet cabling, addressing and protocols. The “S” models accept step and direction, analog input, joystick control, and streaming host commands using the SCL language. “S” models include four digital inputs, a 12-bit analog input, and two digital outputs. “Q” models add standalone programmable operation using the Q programming language. This versatile language includes high-level features such as complex motion, multi-tasking, conditional programming, math functions, register access, and more. The “Q” models include 12 digital inputs, a 12 bit analog input, and six digital outputs. The STAC5 can be purchased with a wide range of high torque Nema 23 & Nema 34 step motors with holding torque ranging from 84 to 1700 ounce-inches. The STAC5 lists at $473 US/ea. Delivery is typically stock to 2 weeks. « Maxon’s Revolutionary and Robust – the MILE Encoder.